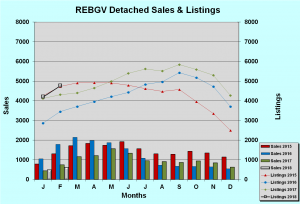 Sales last month were 14.4% below the 10 year average for the month which may not be surprising considering the amount of market cooling government policy that has been directed toward the real estate market in the last 20 months. 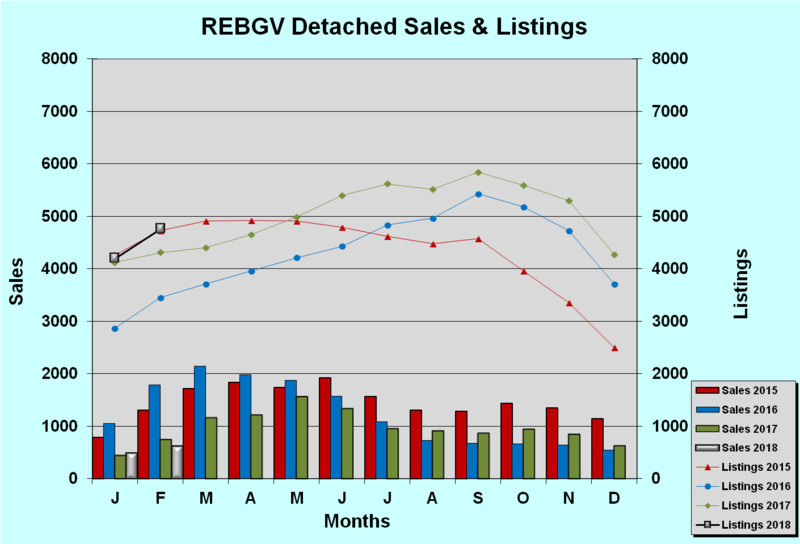 Across the REBGV detached sales were down around 20% (622 v 749) from February 2017 while listings are up about 10% for the same period. In the condo markets it is a different story where demand remains strong and supply limited. 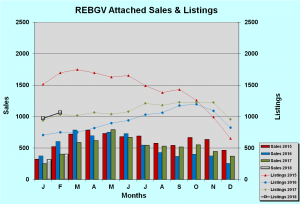 Townhouse sales and listings were at nearly identical levels of a year ago. Apartment sales were down slightly by 7% but importantly available listings were down by 12% from the same period a year ago. The current level of apartment sales (1185) is now well in excess of the combined detached and townhouse sales (1023), a trend we can expect to continue as densification of the Metro area moves forward. Detached prices show a slight softening of 1% since a high in September 2017. Townhouse prices continue to rise slightly after a 3 month seasonal lull, now 17.4% higher than a year ago. Apartment prices continue to rise more sharply with the most recent 12 month increase now just over 25%. Detached (which forms the main part of our housing stock) sales are slow but steady with a perceptible softening of prices in the order of 2.5% over the past 3 months. Condo sales and listings reflect the trends across the REBGV showing steady activity, limited availability and rising prices. Call me to bring professional and experienced ‘added value’ to your move.